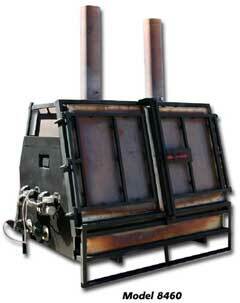 The Phoenix Incinerator comes in four models, which differ in their design and operating capacities. 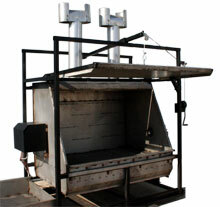 The specifications of all models are listed in detail in the Phoenix Incinerator Specifications page. These incinerators meet all international standards for such crematory, and meet the performance levels of multi-national corporations and agricultural departments worldwide. For safety the units meet high standard requirements for the U.S. Government and private sector, extremely user-friendly as they are shipped into most regions of the world and operate for extremely long periods of time. Per bird or animal cost of the unit is extremely economical because of its high capacity, fast cremation and easy removal of ashes. This applies to all types of waste. Both the models are factory tested and delivered ready to hook up and operate. Maintenance is simple and maintenance support contracts may not be needed. 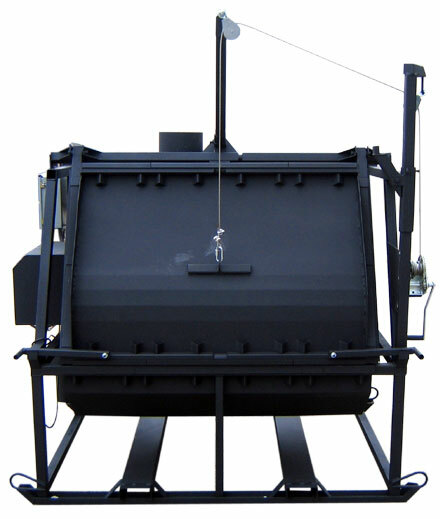 The Model 6045 animal carcass incinerator can safely dispose of up to 500 pounds (227 kg) of unwanted or infected poultry, birds, or other animal carcasses or products. Two models are available: the FL (font load, shown at the right), and the CS (clam shell), shown below. By burning at high temperature, the animal remains are sterilized of infection and the remaining ash can be as little as 10% of the original carcasses. Push button operation and adjustable timers make the Model 6045 easy to operate and suitable for varying loads. 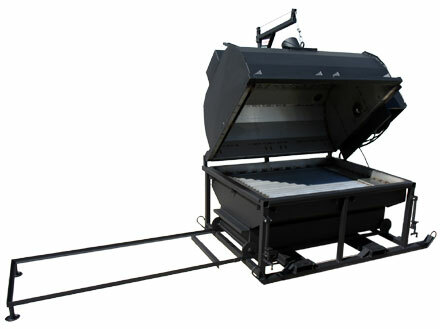 The Model 8460 product incinerator has all of features of the model 6045, plus it can process up to 1,200 pounds (544 kg) at one time. The products are reduced to clean, dry ash which can be easily disposed. The high operating temperatures ensure that, regardless of the type of animal infection, the carcasses are safely and sanitarily burned. The Model 7248-2 features hinged, frontload style opening and a capacity of 750 lb. capacity (72" X 48" X 30"). It has a slide out, drawer style ash tray for easy dumping. This model has 10 Gauge 309 stainless steel body and 11 gauge 2"X2" square tube frame, a stainless steel chimney, stainless steel down draft bap, and 2 Beckett burners @ 2.75 GPH each. As with all Phoenix incinerators, the products are reduced to clean, dry ash which can be easily removed from the drawer style ash tray and disposed. The high operating temperatures ensure that, regardless of the type of animal infection, the products are safely and sanitarily burned.